I spent much of my childhood roaming local bushland, building cubbies and riding my bike as far as my legs would take me. That’s me (far right), my sister and some neighbours, covered in mud after playing for hours unsupervised in our local creek. I’m guessing your childhood was similar? Climbing trees and spending the whole day outdoors exploring nature was a common experience only one or two generations ago. Today, children are more likely to be indoors, busy with structured activities, or confined to the safety of their backyard. I can’t imagine my daughter ever being able to roam our neighbourhood like I did mine. According to Richard Louv, author of Last Child in the Woods, direct exposure to nature is essential for healthy childhood development and for the physical and emotional health of children. One of my new year’s resolutions is to facilitate unstructured outdoor play for my daughter. We already spend a lot of time outdoors exploring nature, but little of that time is unstructured. Now that my daughter is little older (she’s almost four) I want her to have time to explore nature herself, without me bossing her around and following her every move. Providing a backyard natural playground. Camping provides an opportunity to run wild. The only time I’ve seen my daughter truly run wild is when camping. On our most recent camping trip, I loved watching her run wild with the other kids. They explored, created, and imagined. I want her to experience this joy more often. I found the book The Green Hour by Todd Christopher literally life changing. 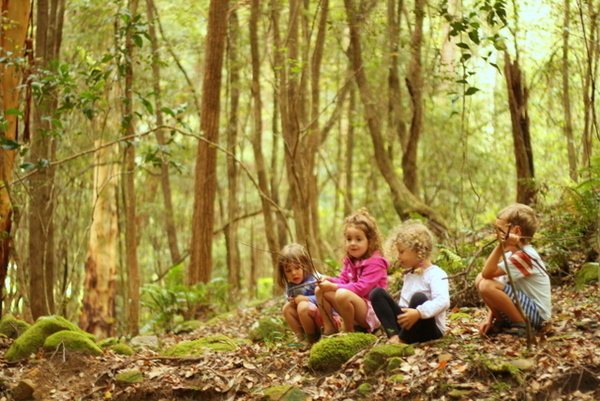 The book suggests that the nature deficit disorder that many children experience today can be alleviated simply by reclaiming a ‘green hour’ a day for play and discovery in the natural world. ‘A green hour is simply a time for families to unplug, unwind, and recharge as they reconnect to the natural world – and to each other’. Brilliant I thought. But I literally couldn’t find an hour each day. Our days were already full. I decided there was obviously something wrong with our lifestyle if I couldn’t find a single hour (out of 24!) to spend with my daughter outside. So I decreased my work hours and arranged to work three days over four. I now walk out of the office at 3pm and 3.30 – 4.30pm is our daily green hour. Just the two of us exploring nature in our backyard, in a local park, or sometimes we simply walk around the block. One of the many benefits of decreasing television time is it frees up time for play. To be honest, my daughter would rather sit in front of the TV than play in our backyard. But if the TV is off limits she will happily play, imagine, explore and create for hours on end. To encourage our daughter to play in our backyard we’re creating a natural playground. So far we’ve created a natural table and chairs out of salvaged stumps and were planning to add a garden loom, bean-pole teepee, plenty of loose parts, and a balance beam. How about you? Do you believe your children have enough unstructured outdoor play time? I’d love to hear any hints you may have for increasing such time. Next post: Mum 2 Mum: How do you choose? thankyou for sharing. my son and I have loads of free nature/screenless play. the last month has been too cold here in california, but we are looking forward to spring. as for television, he gets one episode of Mickey Mouse Clubhouse a day. Great post, Tricia! Your goals for your natural playspace look fun. I love reading about your daughter running wild while camping. Camping is such a fun, freeing experience for all. This makes me, as an adult, want to put some of these goals on my list of new years resolutions. Especially since as an adult who appreciates unstructured, outdoor play, I can encourage kids to enjoy the time as well! We could definitely use more "green time". I think one important component in it is to have friends to spend time outside with. I am committed on trying to get my daughter more in touch with other kids of the neighborhood, so eventually she spends more time playing with them and less time hanging out at home with me. Hi natalie. Friends in the neighbourhood do make outdoor time easier. We've started to meet more kids in the street and having local kids pop over makes backyard play so much more appealing to my daughter. Thanks Sherry. I love your meme idea. I'm definitely going to play along. I love this idea of green time. We live near the beach so I'm trying to take the kids every day to spend some time splashing round and cooling off there. I agree about how important it is for them to have some play and discovery time in the natural world. Wow, this is so true, and such great ideas. As apartment-dwellers, it is harder for us to have unstructured "green time," but I love the concept of this, and wonder how we can incorporate these ideas into our apartment life... Hmmmm. Good food for thought! Your three acres in the country sounds lovely. I'm sure Jada will love time there. Every now and then I go though a phase of wanting to buy a 'bush block' as a weekend camping retreat. Hi Cat. Being an only child does seem to make backyard play less appealing for them dosen't it. I struggle to get my daughter to play in the backyard, but if we have kids visiting she will spend hours out there. I find this happens too. Sometimes if I go out and encourage Immy's play for a little while she will then become absorbed and I can wander off and leave her to it. I'm all for screen-free time and allowing my kids to go outside and explore. While they're not yet at ages where they can venture away from the house unsupervised, there is plenty for them to dig in/create with in our backyard. We also try to get to the park/oval once or twice a week. My kids get cranky if they watch too much tv. We also enjoy camping and want to do more of it this year. The more kids, the merrier. This was a big draw card when it came to us moving 'to the country'.... I really wanted my kids to be able to be outside just 'mucking about'. They could do that a bit in our tiny little back yard in the inner city.... but now we have a 'backyard' area (fenced) bigger than most city house blocks that they can do whatever they like in it.... and the rest of our ten acres to explore (on their own when they are bigger but supervised for now).... and you know mucking about outside is as good for me as it is for our kids! enjoy! Love it, Tricia! My kids & I are all about exploring nature in our backyard & beyond, so I'm a huge fan of anything parents do to support that goal. Best to you in your new adventures in the year ahead! I love your ideas Jus. I think we might try breakfast outdoors tomorow. Thanks. We had breakfast outside yesterday and it was lovely. What a fantastic resolution and a brilliant post! I loved reading the research that you quoted as it made me feel secure that we are doing the right thing for our little girls. Living on a farm our kids naturally spend lots of time outdoors and with their pets, however operating a tourism business and hosting families from inner cities, we constantly see kids who just don't know how to ammuse themselves outdoors. It is just plain sad! Grace loves finding bugs, making cubbies, playing in sand and water, growing plants, being on the tramp and riding her scooter around the place. I find she is sooo much better behaved if she has been outside for the day whereas she can borderline ADHD when being stuck indoors fo extended periods! Thank you so much for this post!!! Thank you Sophie. I'm glad it helped you feel secure about your girls childhood. I imagine your farm would provide a perfect childhood. I totally agree! I've been thinking wistfully about my own 'free' and outdoorsy childhood too - all that exploring and learning, the fresh air, the physical challenges, friendships forged - the excercise! There's just no way my kids are going to have the same experiences - we live in a much more densely populated area for starters. But I have always tried to include dedicated time outside into our everyday routine. There's always washing to hang, chooks to feed, eggs to collect, seedlings to plant, pruning, weeding, etc. The kids participate in some of this, and they have a great sandpit under the plum tree, edged with big sandstone blocks. And at this time of year when the weather's so warm I often fill an old galvanised wash tub with water and let them at it - they scoop, pour, add sand and dirt - it keeps them occupied for ages! It does get harder for us in winter (in Hobart) though... But as you say, a walk around the block always possible, even in the pouring rain. PS We did build a runner bean teepee (inspiration - you!) but the combination of chooks and a windy night did away with it. We'll try again though! I find gardening and chook chores helps to encourage outdoor play also. Your sand pit sounds lovely and I love the idea of the old wash tub. I'm going to keep an eye out for one. Oh, shame about the teepee. This is a topic dear to my heart! I agree! I agree! http://furlinedtoiletseats.blogspot.com/2010/09/building-houses-in-woods.html I love letting my littles play their own games outside. I think I'll be creating a table and chairs like yours! Thanks for this post. Your forest looks lovely Fatima. What a lovely space for your children to play. 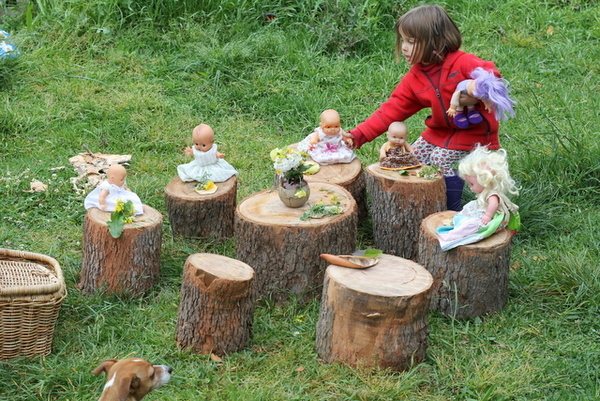 Hi Tricia, after first seeing photos of your tree stump chairs and table you inspired us to create our own at preschool: http://progressiveearlychildhoodeducation.blogspot.com/2010/12/tree-cookies-or-tree-biscuits-or-tree.html Loved this post! It is nice seeing other parents doing this too. We moved into a new to us house about a year ago. One of the things we inherited on our 3 acres was a mostly decomposed mulch pile. My boys have LOVED digging in that and spent hours spreading it out for us. They have learned so much about bugs and worms. We also have plenty of flowers which my daughter has turned into fairies and fairy houses. We homeschool to have more time for the kids to be kids, but are changing our focus from virtual to Charlotte Mason so that we can have less time at the computer and more freedom to be outside. One of my favorite activities as a kid was sitting outside in the sun or in a tree to read a book. I want my kids to have time to do that too.